Many Iraqi cities witnessed large demonstrations after Friday prayers (yesterday). These demonstrations were calling for national unity, not being pulled into civil war after attacks on Sunni mosques as retaliation to the bombing of the samara Shiite shrine. In Mousul 500 people demonstrated in Bartila (north west of the city). The demonstrations were lead by Sunni & Shiite leaders to condemn all bombings and call for a unified line and not be pulled into a sectarian war. Another demonstration started from the offices of the high council for Islamic revolution (Shiite). The demonstration was lead by Sunni and Shiite religious leaders. Banners condemned attacks on mosques, shrines and churches the banners also condemned terror also no to Saddam yes to Islam. In Hillah over 3000 demonstrated after Friday’s united prayers (Shiite & Muslim together) at the Haytaween mosque. The united prayers were lead by Sheik Mohamed Alfateh (Sunni) and Sheik Jasim Alkalebi (Shiite). The two speakers called for Muslim unity and denounced all terror activity as unIslamic and asked for keeping unity. In Al-Koot hundreds demonstrated after Friday prayers protesting the bombing of the samara shrine and the attacks on the Sunni mosques. Unified Friday prayers in Al-Koot were held at the large central mosque in the city. Speakers at the prayers call for rejecting sectarianism. In Amarah over 15,000 demonstrated after Friday prayers condemning the samara bombing and attacks on Sunni mosques. Banners read, Sunnis & Shiites are like Hassan & Hussein (referring to two grand children of the profit Mohamed), banners also read that Muslim references (Shiite religious leaders) condemn terrorism in all its forms. In Karbala Sheik Abdulmehdi Alkarblaa’i (representative of Sustain) in his Friday after prayers speech at the Hussein Shrine called for peaceful and brotherly coexistence, condemned violence and called for national unity. He added; “We know the nature of this crime and the ones before it, we also know these crimes are not of Sunni doings, but they are the deeds of the enemies of Sunnis & Shiites”. In Basra over 10,000 demonstrated with banners asking to form the new government as quickly as possible. 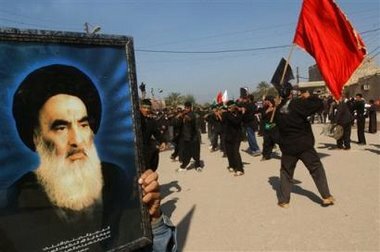 Much praise to Ali Sistani who called for calm after the Golden Mosque blast. We have much more evidence of a strong national unity movement in Iraq. This is exactly the opposite of what the bombers of the samara shrine (Alzarqawi’s group is a strong suspect) wanted to achieve. This attack was supposed to plunge Iraq into sectarian mayhem and senseless massive killing. This did not happen. A few over zealous individuals attacked Sunni mosques (8-11 Sunni mosques burned and small arms fire hit about 100) and killed Sunnis (120-160). There is no excuse for these retaliations; they are exactly what the enemies of democracy and freedom in Iraq want. It is playing into their hands. 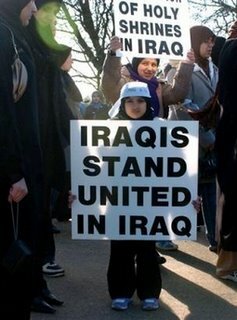 Let us remember that Iraq is the size of California and has over 25 million people. Every neighborhood has at least two mosques. Considering this the retaliations are small while tragic. 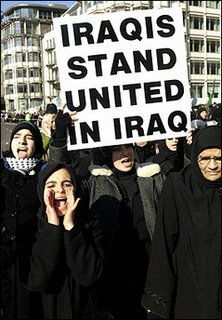 Demonstrations in Baghdad (in spite of the curfew) called for national unity. Combined Sunni & Shiite prayers were held all over Iraq. This is a sign of a people united not divided. A people with a common cause (defeating terrorism), a people with a common goal (self rule through democracy, rule of law & freedom). The terrorists are bringing about their eventual demise by uniting Iraqis. We witnessed this effect on 9-11. Americans were united and developed the strong resolve to fight terrorist. Let us not forget that we were attacked not so long ago. Bill Roggio, who just returned from Iraq, says the threat of an all out civil war seems to have abated. Iraq the Model corrected the media yesterday with their exaggerated reports. Sunni Arab leaders had pulled out of negotiations on Thursday, but had rejoined talks with Shiites and ethnic Kurds by Saturday evening. With the encouragement of President Bush, who called seven politicians from the three sides to encourage them to seek peace, the faction leaders met for three hours. Wizbang contrasts this news with the latest TIME cover. Truth Laid Bear has a questions about the reports coming from Iraq. TigerHawk says the Sunnis are finally getting a clue. Iraq the Model continues to be an exceptional source on the situation. Pajamas Media is carrying the story.